If there is one consistent problem with a Rob Zombie movie (and there always is) it’s that he makes movies for a very small and very specific type of audience. If you’re not in that group than you shouldn’t even waste your time because you’re not only gonna hate the movie but you’ll be so revolted by it that you’ll want to leave. Luckily for him, I fall into that small group. When his first movie “House of a 1,000 Corpses” came out, I thought it was funny, disturbing, and a fresh take on the grindhouse films of the ’70s. Although it went in a completely separate direction, the sequel “The Devil’s Rejects” was possibly even better. After that, came the original remake of “Halloween.” Zombie wanted to tell HIS version of the classic John Carpenter horror. I thought he did a good job with it. He gave depth to the Michael Myers character by adding a 45-minute-long backstory as to why is the psychotic killer that he is and in-turn gave him a soul. But the problem was that it was a success. The movie made over a hundred million when it was all said and done and pressure was put on Zombie by the studio to make a sequel. Rob Zombie movies are not made to be mainstream or box office success. I’m not saying this out of an elitist want to keep him indie. 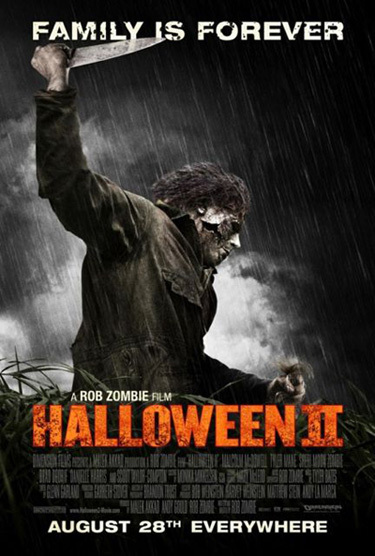 I’m saying this because “Halloween 2” was made to be mainstream and it simply did not work. It turned into exactly what is wrong with the horror genre today, whereas the entire movie is made up of the same scene done over and over again with no story ever developing. I’m glad that he got the cast to return which includes the always impressive Malcom McDowell and Scout Taylor-Compton, but it wasn’t enough. (It wasn’t enough for me to have Danielle Harris return since I’ve had a huge crush on her since I saw her in “The Last Boy Scout” when I was 13.) Zombie is getting much more confident as a director. He uses color and lighting in ways that most directors would consider to be too ridiculous or theatric. But that’s becoming one of his staples. He also used soundtrack in this film in quite innovative ways. I’m not talking about the music though; I’m talking about the FX. Besides the torturous sounds of knives sawing through muscle and bone and stabbing through limbs, he has sounds that make no sense in the scene playing so prominently that it’s almost distracting. One suspenseful scene in particular has no sound at all except for a record skipping…awesome! But again, it’s not enough. The script is awful, the story was non-existent and the pacing of the movie was just confusing. I await Zombie’s next movie in hopes that it’s another box office failure, which might make it a success to me.